The history of the jerrycan is very interesting to say the least. Developed by the Germans in 1937 by the Müller engineering firm, it was officially called the Wehrmacht-Einheitkanister. The cross-like indentations that can be found on the sides of the cans strengthened it, allowing the contents to expand. Also an air pocket under the handles allowed it to expand when filled correctly. Thousands were spread among the troops in the leap towards the Second World War, and were used with succes during the advance in Poland and the Blitz in the ardennes. The Americans later made their own version based on the German canisters, and nicknamed it ‘the Jerry can’, as the Germans were referred to as ‘Jerry’ during wartime slang. However, some details were added to the can, which actually made them harder to use than the original, because it had to be opened by using a wrench and a funnel. 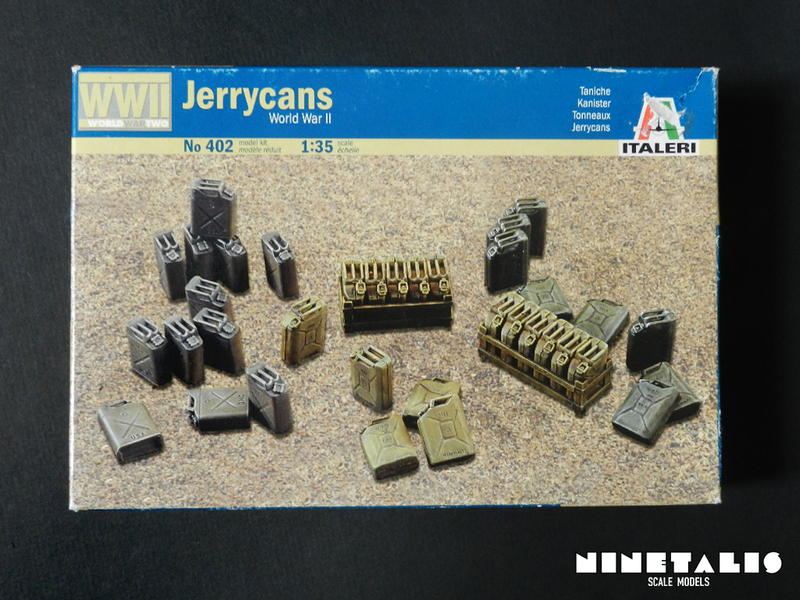 The British even went a step further, and used German canisters they had captured, nicknaming them jerricans (as oppose to the American ‘jerry cans’). The packaging is made from thin cardboard and can be opened by lids on the sides, which are closed with transparant stickers. 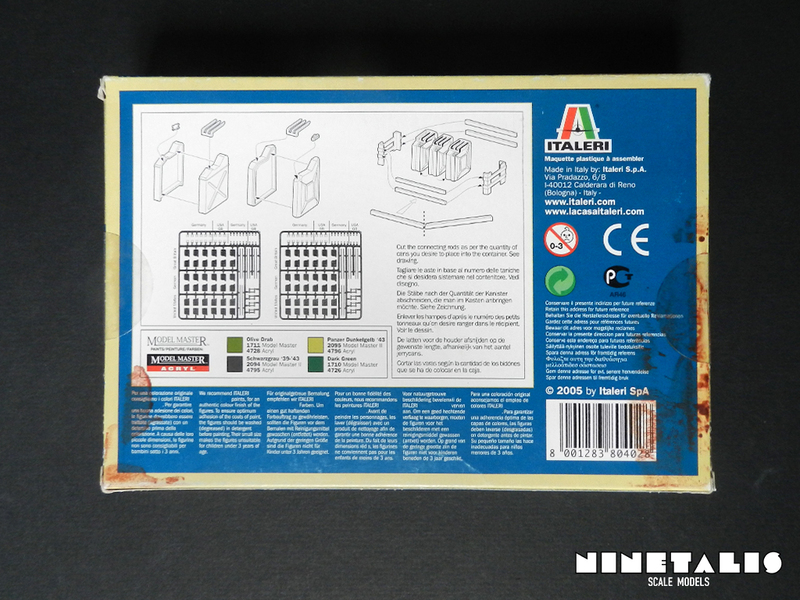 On the back of the box we can find the actual instructions of the kit and the color chart. The colors are provided with the color codes of the Modelmaster and Modelmaster acryl paints. 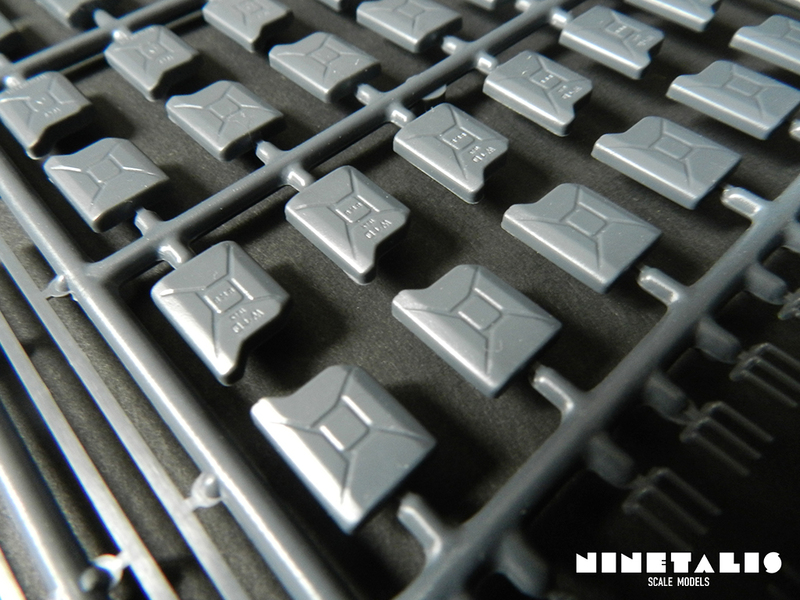 Inside the kit we can find two sprues, holding 84 parts each. 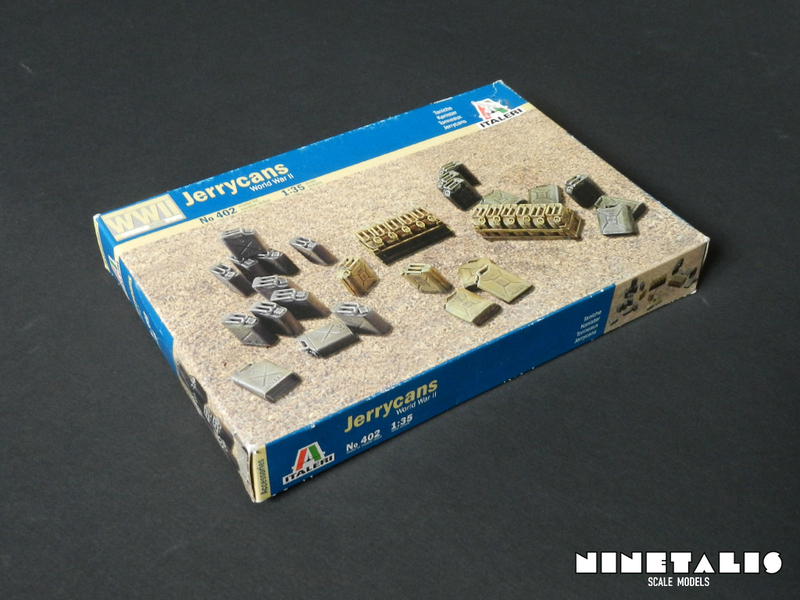 On each sprue, we can find six American Jerrycans, six British cans and six German canisters, so in total we get 36 canisters with this kit. Each can is divided into four pieces, being the two halves, the lid and the handle. 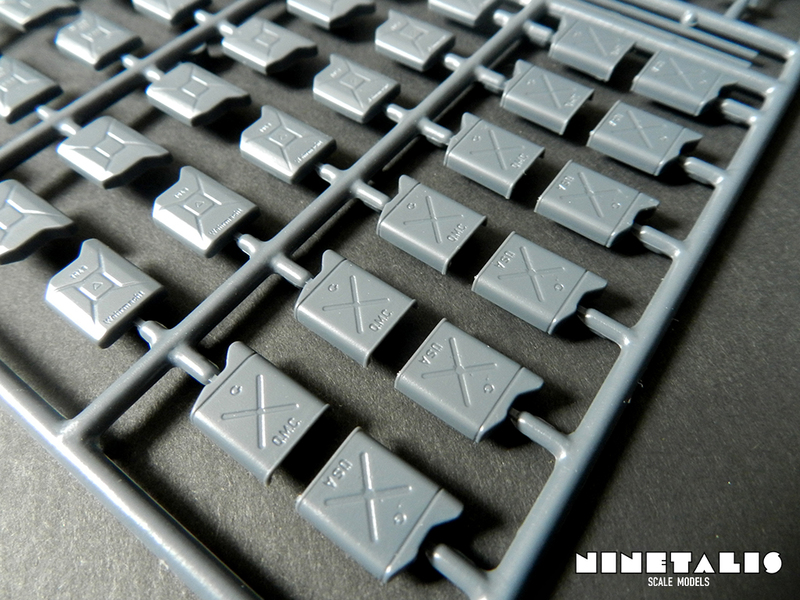 The parts are really detailed, as we can find small recessed text in the canister halves and even the screws on the American lids are represented as raised details. 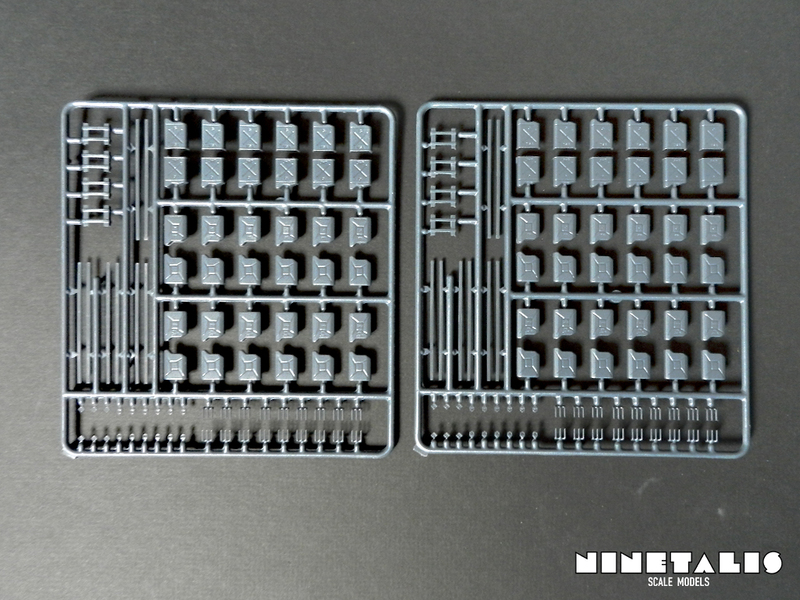 On the sprue, we can also find the parts to create a basket to hold up to six canisters. You can also cut these to a certain length if you want a smaller basket. 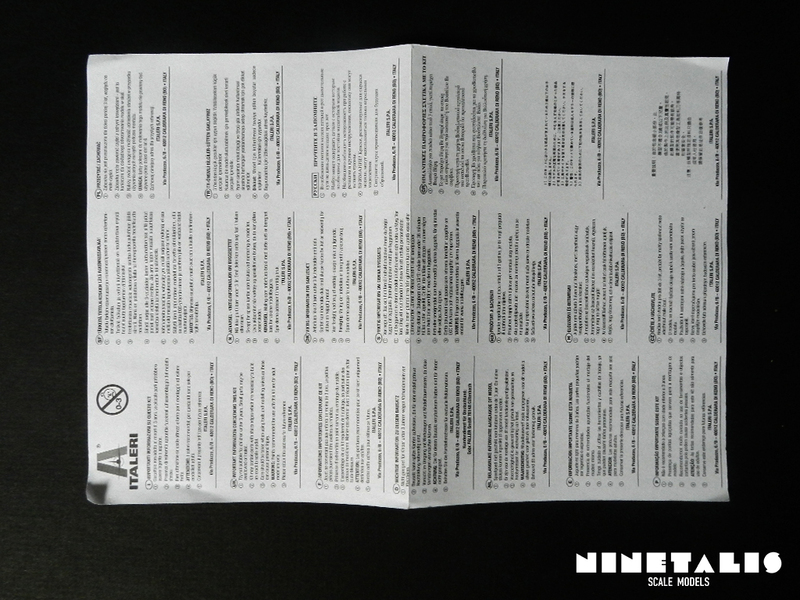 A small sheet of paper is also included inside the kit and displays the usual warnings we are accustomed to (like keeping the small parts away from young children) in various languages. 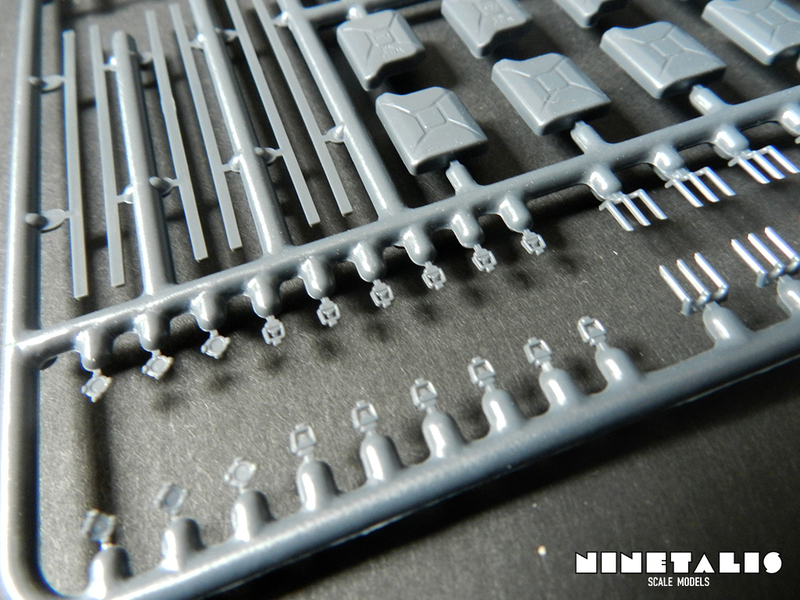 On the backside we can find a small document which you can send to Italeri if you are missing a sprue or parts. This is a nice little kit, and I’m quite shocked by the amount of parts that can be found in this small kit. If you consider that you get 36 canisters for 8 euros, I can’t see why wouldn’t be a good deal. After all, with some quick match, that means 22 cents per canister, not even taking account of the the two baskets you get as well. Some people might not like that we only get six canisters of three different countries, instead of 3 kits for each country, but I’m sure the prices of these kits would be a lot higher due to production costs. No decals are included, but then again, why would Italeri even need to? These canisters never really sported any text besides the recessed text we can find on the cans. 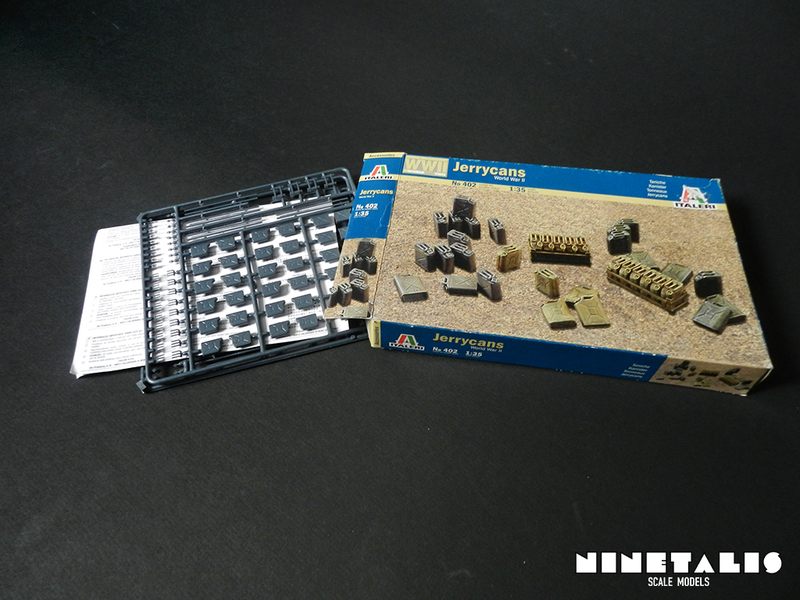 The kit is not only usable for people creating World War II dioramas, but can also be used with more modern armor, as many of these canisters (especially the German design) are still being used today. Considering the low price, I’d definitely recommend this kit.